Duisburg, 18. June 2018 – Imperial Logistics took part in this year’s German Sustainability Action Days with an internal sustainability week at the company. Imperial Logistics had selected the topics of health and the environment for its first sustainability week. 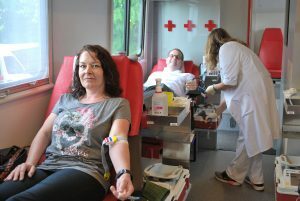 Employees were able to hand in any mobile phones that were no longer required for reprocessing or recycling and donate blood in a mobile medical bus organised by the German Red Cross. Physiotherapists provided support for healthy breaks with exercises in individual or group training sessions and showed people specific exercises for coping with stress. Imperial Logistics employees gained their first experience of e-mobility on test journeys in electric cars or on e-bikes. A sustainability quiz provided the participants with easy, but informative contact with the subject of sustainability and the goals of sustainable development that had been selected. The German Sustainability Action Days have their roots in the UN Conference on Sustainable Development (Rio+20) in 2012. The basic idea behind them is that each person can change something to introduce improvements, provided that the activities match the 17 sustainability goals set by the United Nations. They include issues like health and well-being, affordable and clean energy and climate protection measures. The sustainability week formed part of a package of other sustainability initiatives, which include internal car sharing, corporate volunteering and promoting mobility on bikes. Imperial Logistics employees also travel between the business locations with low emissions by using a pool of plug-in hybrid vehicles. The company is also providing incentives for environmentally-friendly mobility by leasing cycles as business bikes for employees – and they can use them for private purposes too. Imperial Logistics had supported one employee’s “Walk for Children” by making a donation to the project. The total amount of EUR 5,000 benefited six support facilities in Germany and South Africa.